Hummus is the one thing that 3 out of 4 of people in my home will eat. It’s vegetarian, a protein, as flavorful as you want and can be changed up in many ways and used with so many meals. The two favorites at our house is this Garlic Hummus and my Roasted Red Pepper Hummus. I’m experimenting to see what else I can toss in there to change up the flavor. I just got a jar of peppadews and I’m thinking of giving that a go. What about you? What flavor hummus do you like? Kalamata Olive, Sun Dried Tomato, Artichoke or Extra Spicy? Now I’m sure you want to know my secret ingredient. It’s the one thing that is the difference between a passable hummus and a really good lick the bowl hummus. It’s all in the tahini sauce. I’ve tried 5 or 6 different brands, some organic and some not. 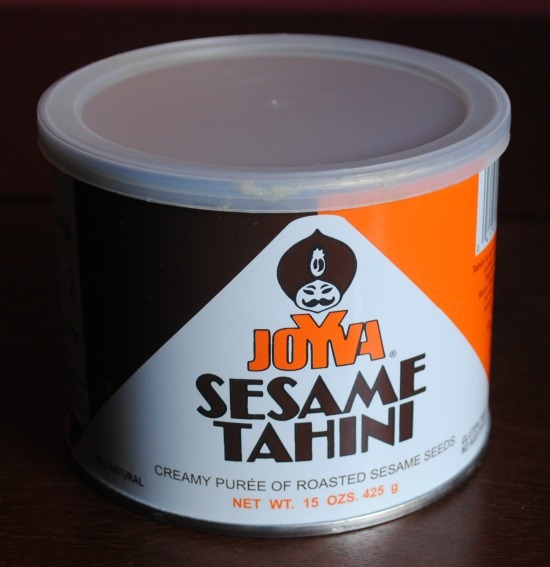 No one will even eat my hummus unless I use the Joyva Sesame Tahini . It really does make all the difference in the world. You can find this in most grocery stores but just in case you can’t I’ve shared my affiliate link. If you want to make this dish for pennies instead of dollars, start with dried chick peas. You can soak them all day and then toss them into the crockpot on low to cook overnight. Drain the next morning and put in the refrigerator to cool. They will be ready to mix up into the most amazing hummus and you will have saved a bundle. Oh and you won’t have to worry about spending extra for a BPA free can to get BPA free chickpeas. What you can serve with your hummus is also a long list of possibilities and all of these are gluten free of course. Red, yellow or orange bell pepper strips, carrots, cucumbers, celery, radish, tomatoes, rice crackers, falafel, gluten free pita, chicken or lamb skewers. What a great spread you could make with this for your Super Bowl party. Mix us different flavors and have a large assortment of great things to dip into the hummus. Keep in mind dipping your finger adds no additional calories, just keep that to your own plate. Here is a tip from an ex-caterer. You can make a big splash at your party with your serving containers. For parties I like to put the hummus into scooped out red cabbage, green cabbage, peppers, and tomatoes. People will think you had an expensive caterer create your spread but you can just smile and said you did it all! Add to your food processor the chickpeas, tahini, lemon, garlic, salt and peppers. Turn on the processor and pour the oil in from the top. You’ll want a creamy consistency. Stop and taste and then adjust your seasonings and add more oil if you want it a little more creamy. When serving drizzle the top with olive oil or create a crater in the center and add the garlic there. I like to sprinkle on the Zaatar on top. If you want to make this into the Roasted Red Pepper Hummus add in 2 whole large roasted red peppers, no seeds. We use the same tahini! I love experimenting with different flavors in my hummus. Kalamatas. Spanish olives. Roasted red peppers. 😀 Spanish olive is usually my go to. Debi Ann thank you for stopping by and commenting. Your hummus sounds great! Don't you just love that tahini! If you've tried any others and had the same success please let me know. I haven't tried that tahini, but you've sold me now Diane! Leftover cooked beans freeze well too. Alisa let me know if you give it a try. I'd love to know what you think about it too. Yum, love the zaatar on top. I do use Joyva tahini sometimes so I'm glad to hear it's the best one! Jeanette thank you for stopping by and commenting. It's always nice to find another zaatar fan. I'm always looking for more ways to incorporate that into a dish. Any ideas? Thanks for the tahini tip! I've tried a few different brands and have generally been disappointed by the flavor. I've begun to believe that tahini might just not be for me but I'd like to try your brand and see if it makes a difference! Hannah let me know what you think when you try it. So far we think it's hands down the difference but I'd love to hear from others. How many servings does this make? 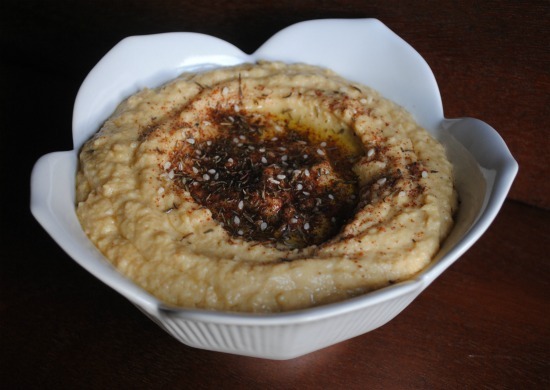 I am making it for my super bowl party and I have a lot of hummus lovers! Sarah it's hard to say because I have no idea how each person will be eating this. Usually the 3 of us can eat all of it if it's our dinner with vegetables and Chicken Shawarma. If we're just snacking with other foods it will take two or three snack times to get through it. I'm guessing if you make it, it will be gone before the end of the game. Have fun! I posted my question too soon… Lol. I made a batch and tasted it, only to say "oh yeah, we'll need more of this!" it was so delicious! Thanks for all the great recipes and tips, Diane! Thanks for posting this recipe. I tried one that omitted the olive oil and it came out too dry. I love your recipe and shared it on pinterest. I love this brand of tahini. I believe hummus has to have tahini its just not the same in my opinion. I went to a christmas party and had some mashed potatoes that had tahini and it was good but not as great as the no bake cookies that were made with tahini they were awesome…..